Snowboard, ski, surf, skate... You name it, and we're most likely into it! Corvallis Oregon Freeride A.K.A "C.ORE Freeride," started in 2009 at Oregon State University. C.ORE is devoted to skiers, snowboarders, and thrill-seekers alike. 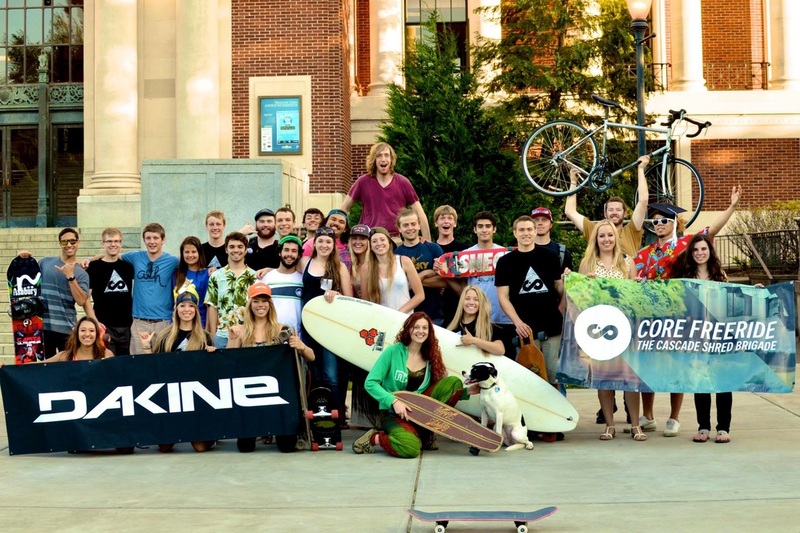 Aimed at providing an outlet for extreme sports within the college community, C.ORE Freeride also embraces and promotes the mountain/surf/skate/laid-back lifestyle and creates a niche for shredders in Corvallis, Oregon. Not only do we love to participate in extreme sports, we also love to kick back, relax, and socialize! From mellow pot lucks to all day parties, C.ORE is a way to connect, network, and let loose with peers in a fun, easy going atmosphere. Our goal is to promote a community and lifestyle revolving around the action sports industry, as well as provide an escape from the everyday college grind. So if you enjoy shredding the slopes, catching some surf, and kicking back a few beers with friends, join C.ORE Freeride and check out what you have been missing in "The Cascade Shred Brigade!" C.ORE Freeride holds regular meetings throughout the school year to keep members up to date on our up-coming events. Meetings are a great time to jot down important dates, meet other OSU students who love to shred, drinks some brews, and win awesome swag from our supporters. It's also one of the best times to network and find rides for future adventures! No better way to bond than sharing a 3 hour drive to Mt. Bachelor with your C.ore homies. As a C.ore Member, you'll soon realize that weekends mean endless opportunities for adventure. When wondering, "Gee, what should I do this Saturday? ", you'll be sure to find a group of Cormies hitting the mountain, coast, bike trails, rock faces, skate parks, etc. One great way to find or offer a ride is go on the C.ore Carpool or C.ore Facebook Page. If you have an adventure in mind, hit up your Cormies! Heavenly, Park City, Whitefish, and Grand Targhee, you'll be frothing at the mouth to hear where we're going next. If that's not enough, we throw rad events such as Movie Screenings, Ladies Nights, BBQ's, and "Members Only Secret Events", to keep you stoked throughout the school year. Join C.ore Freeride and see what you've been missing.